The response to our request for information about the stabling of Barnum and Bailey’s Circus Menagerie on farms in western Berks has been generous. We are indebted to Mrs. Pearl Sensenig, Lyman G. Schaum and Miss Emma Klee of Womelsdorf; to Mr. and Mrs. Francis Zerbe of Bernville; To Harry F. Ressler of Reading; to Rev. Wellington Leininger of Cleveland, Ohio; to Mrs. Marvin H. Bennetch of Millbach, and to Mrs. Mary Peson of Myerstown for the facts which are assembled here. All correspondents agree that the animals belonged to the Barnum and Bailey Circus. They differ in fixing the dates when these animals were placed in barns in the Lebanon Valley for winter quarters; these dates vary from 1903 to 1909. Of course it is quite possible that all of them are correct, because the circus people may have continued the practice for a number of years. All of the informants locate the farms on which the animals were stationed at the foot of South Mountain, in the Sheridan-Newmanstown section. On the farm now owned by Marvin H. Bennetch, near Millbach there still stands a barn known to the community as the “Horse Barn.” The barn was built for the specific purpose of housing circus animals. On a farm, known as the Bucher farm between Schaefferstown and Kleinfeltersville camels were stabled. The floor of the barn was raised so that the stable would be high enough. One of the camels housed in the Bucher farm died. The hide of the animal was tanned and now covers the davenport in the Marving Bennetch home in Millbach. Show horses were stabled on the J. Henry Bennetch farm, now owned by Clarence H. Bennetch of Reading. The members of the Bennetch family were the especial guests of Barnum and Bailey during one of the circus visits to Lancaster. Mrs. Marvin Bennetch relates that it was during this entertainment that she ate macaroni for the first time. ON the S.S. Long farm, south of Newmanstown, horses and camels were cared for by attendants hired by the circus. At Sheridan, on a farm known as the Eckert farm were housed Zebras and “The Sacred Cattle of India,” as Barnum advertised his menagerie. 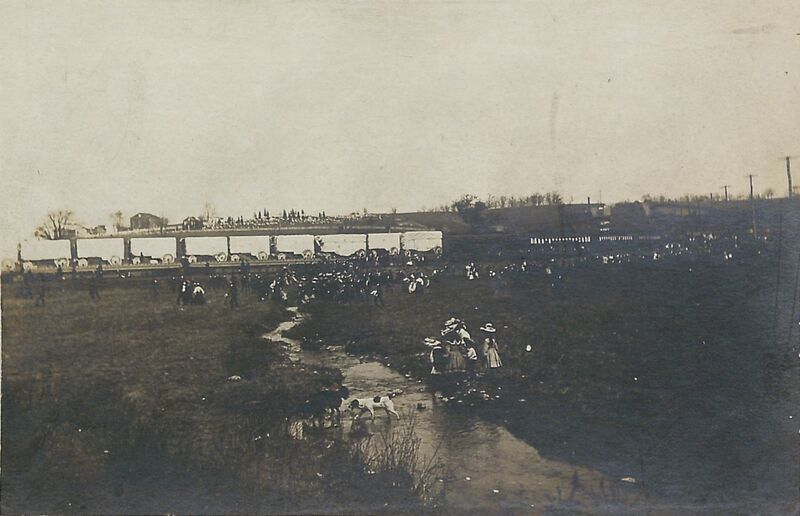 The Monroe Zimmerman farm near Millbach, later owned by the Ohls of Robesonia, many show horses and cattle were stationed. Harry F. Ressler writes to tell us that the Amos Hershberger farm near Sheridan housed horses, ponies, llamas, yaks, zebras and zebus. The Rev. Wellington Leininger describes his surprise when he saw a boy leading a hunch-backed cow to the stream to drink, it was a Burmese cow from the circus menagerie, housed on a farm near Womelsdorf, he recalls. The well-built barns, the abundance of grains and hay and straw and the excellent animal husbandry of the farmers of the Lebanon Valley must have been the factors which induced Barnum to trust his precious beasts to the care of these Pennsylvania Dutch farmers. Circus Train in Muhlenberg Township. Circa 1908. Courtesy of the Berks County Historical Society. We cannot help wondering just what the dialect equivalent was for the ringing call “Tally Ho!” so reminiscent of the old stage coach days. A few generations ago, and within the memory of many of us there were a number of stage lines extending from Reading into the more remote parts of the county. There were lines leading to Shillington and westward, to Boyertown and to Bernville. They carried express, freight, passengers and the mail. The coaches were closed and built to accommodate from six to a dozen passengers. At the rear there was a section of the coach set apart for freight and a large canvass which was fastened to the roof could be dropped over the protruding cargo. This section was called the Boot. Most coaches had the inscription U.S. MAIL lettered on each side. The Bernville route was the longest. It extended from Reading to the Bernville Station at the Eagle Hotel and then continued on through Schaefferstown, Rehresburg, and Bethel. From the Bernville Station a spur line extended to Mohrsville. The stage coach left Reading for Bernville at 2 p.m. and traveled by way of Leinbach’s Hotel or State Hill. It reached Bernville at 6 p.m. and then continued during the night to Bethel, returning to the Bernville depot early the next morning. The drivers of the old time stage coach were a hardy lot. Among those driving back in the 1880’s was Jacob Bordner who covered the Bernville route for many years. He held the government contract to carry the mails to Bernville and all intersecting points and routes. Another driver was John Haas, a quiet, reserved man, who drove the Bethel stage. The Mohrsville spur line was in charge of a genial old fellow named Christ Koenig. Conerning Koenig there is a story told that he was impatient with visitors who remained too long. On one occasion he remarked to his wife sleepily “Sarah, mir welle ins Bett, Die Leit welle Haem.” His guests took the hint and departed. One of the earliest stage coach drivers on the wild and wooly west was nick named Curly. His route led from Sacramento, California to the gold mines. 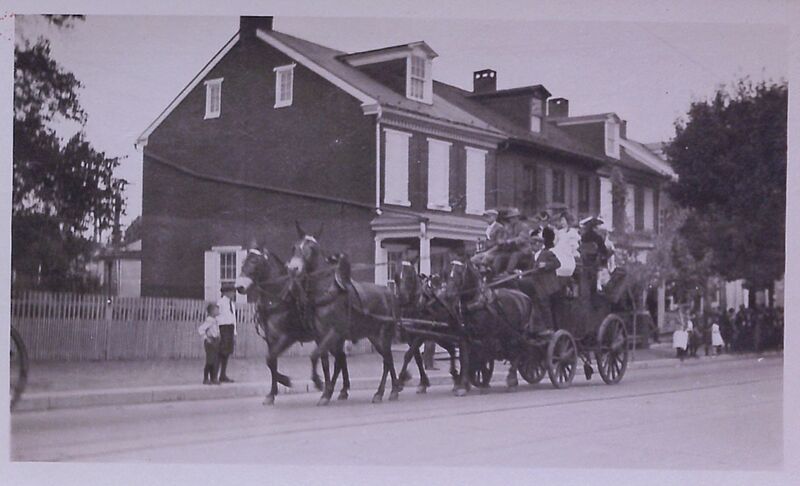 Passengers would schedule their trips in order to ride on Curly’s coach because he drove so well and regaled his passengers with native Pennsylvania Dutch humor. His real name was Gerhart, and his home was Reading, PA. TALLY HO!